NA: Is your Stadium Events copy valuable? Prior to being released by Nintendo as the Power Pad, Bandai test marketed their version of the peripheral in the North Central United States. Their version, known as 'Family Fun Fitness' was released alongside the one game compatible with the device, Stadium Events. Shortly after release, Nintendo of America purchased the North American rights to 'Family Fun Fitness' and decided to market it themselves. Stadium Events was also renamed and repackaged under the title World Class Track Meet. Despite the change, the two games remain virtually identical to one another, aside from the title screen and the Bandai brand name appearing in game. 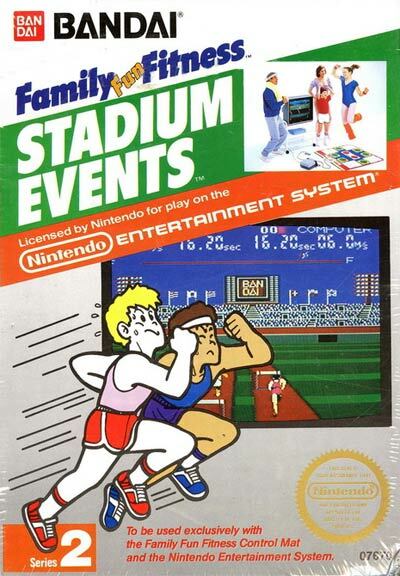 As a result of Nintendo's acquisition of the rights, all Family Fun Fitness branded units and copies of 'Stadium Events' games were pulled from store shelves immediately. This makes it, without a doubt, the hardest to find licensed game collectible for the Nintendo Entertainment System. Note: the PAL version of this game is not nearly as rare as the NTSC version. The rarity also makes the cartridge and package a particularly tempting target for forgery. Make sure you know what you may be buying, as well as what you may be trying to sell. With the recent news explosion surrounding this game, there are plenty of fraudsters about. Check out this nifty Visual Guide to Buying Stadium Events from NintendoAGE in order to help determine whether your copy of Stadium Events is worth anything.